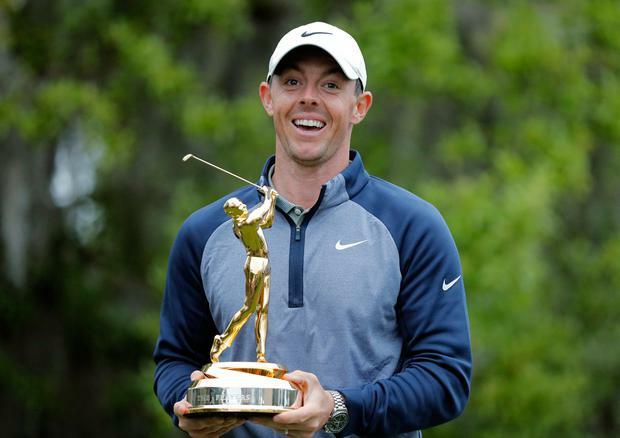 Rory McIlroy will have to do something only Tiger Woods has achieved if he is to become the sixth player to complete a career grand slam at next month's Masters. Sunday's victory was achieved from the penultimate pairing but was nevertheless significant for the way McIlroy recovered from a double bogey on the fourth and another dropped shot on the seventh to birdie five of his last 10 holes. McIlroy's record in 2019 now read 4-5-4-2-6-1 in terms of finishing places and the 29-year-old credits his increased maturity and perspective for one of the most consistent spells of his career. "I think it's been having a focus over the last six or seven months on my attitude, especially my attitude to golf, and not letting golf define who I am as a person, trying to keep the two things very separate," McIlroy said. "One thing that I used to do in the past is let what I shot that day influence who I was or my mood. To try and keep those two things very separate is something I've worked hard on because who I am as a person isn't who I am as a golfer, and it took me a while to get to that point where I realised who those two people were. "I've had two wins in the last 12 months, but even the play in between that has been pretty good, top fives, top 10s, given myself a chance most weeks." McIlroy's 15th PGA Tour title has lifted him to fourth in the world rankings and made him the betting favourite for the Masters, but domestic duties will ensure the four-time major winner keeps his feet firmly on the ground. "I don't want to look too far ahead," McIlroy added. "I really want to enjoy this. "I've got a week off. I've actually got an interior design meeting on Monday morning to pick out some stuff for our new house, so that's the next port of call.